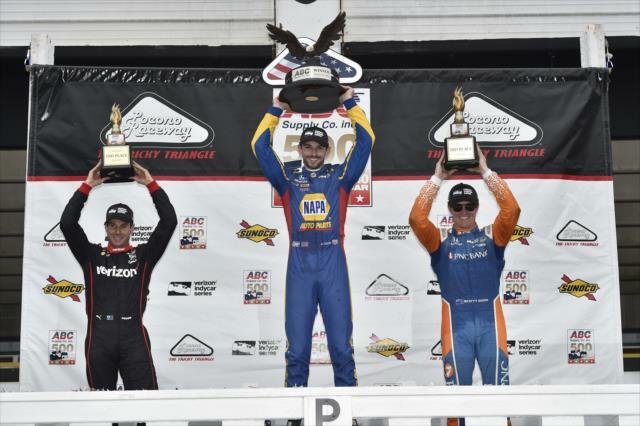 Pocono's Tricky Triangle became a traffic triangle for the ABC Pocono 500. But Alexander Rossi managed to pass a last minute backmarker enroute to win is 2nd consecutive event in a row and his 3rd of the season spoiling Will Power's quest for his 3rd straight event. Rossi's win with pit strategy enabled him to trim 3rd Place finisher Scott Dixon's series lead from 46 to 29 with Dixon holding off Sebastian Bourdais as the last car on the lead lap. But the race had a somber mood during a red flag session. 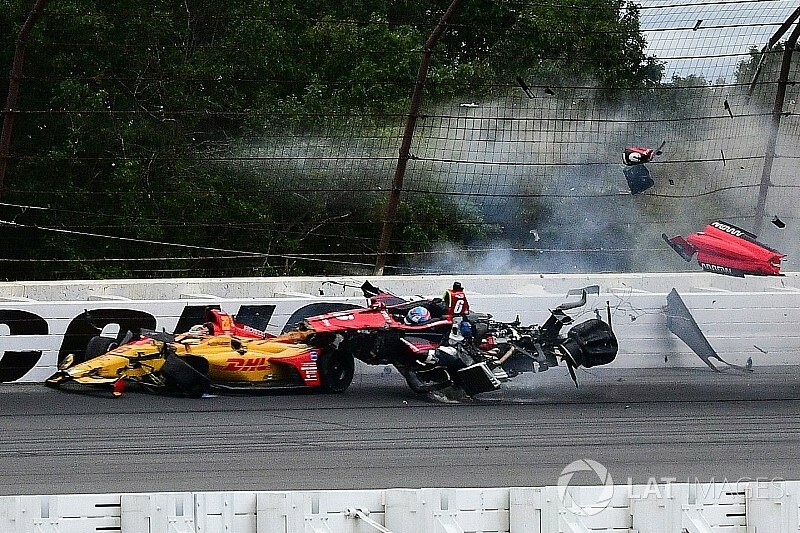 The race was marred by a huge crash in turn 2 on lap 8 when Robert Wickens nudged Ryan Hunter-Reay's rear-left tire causing a spin with Wickens sent flying into the guardrail demolishing his car. Takuma Sato was also involved as is Wickens teammate James Hinchcliffe who could not slow down when he spun around. Pietro Fittipaldi (Who made his return after his incident at Spa during a FIA WEC event) also spun into the wall striking Hinchcliffe in the process. Dixon managed to get by the incident. It took at least over 2 hours to rebuild the fence. Pietro would walk away from the crash this time. Josef Newgarden , Marco Andretti, Zach Veach, and Simon Pagenaud finished 5 thru 8th respectively after going 1 lap down. Charlie Kimball sealed 9th automatically after going 2 laps down. Ed Carpenter rouds up the top 10 3 laps down. The standings remain the same as it was after Mid-Ohio. The next round will be a Saturday matinee at the Gateway. And here is an update from Schmidt Peterson Motorsports via twitter in regards about Robert Wickens as we wish him a speedy recovery. Last edited by Placid on Mon Aug 27, 2018 11:02 am, edited 1 time in total. Thanks for the update, Placid. I have been watching for one, but hadn't seen one. Sounds like Wickens still has a lot of issues to deal with, I sure hope they all work out well. 1 way or another, everyone needed to know. I could imagine him how broken he is physically. With the extent of his injuries, he is likely done for the season. I (and I think a lot of other people on Twitter) genuinely feared the worst when there was no update posted for the best part of an hour. It really was a pleasant surprise when the update came and it was that he was alive and alert. To come out of that crash with *just* broken ankles, a broken arm and a potentially fractured vertebrae definitely seems like a win, all things considered. Yes, although it's still a very relative thing. Spinal damage can be very serious, and I just hope this isn't a career-ending injury. But he's alive, and that's the most important thing without doubt. All the best to RW. Scary scary stuff. So glad that RHR walked away from this one. Same for Pietro after his scare at Spa. This image from motorsport.com is the one that scared me the most. Just look at Robert's head right after the initial impact. And a HANS failure is rare. He was lucky that his head went to the side. If it would have hit the steering wheel, it could have been beyond worse. Now some morons are attacking him because some ignoramous moron wasn’t paying attention and thought he was talking about Wickens, and immediately took to social media to criticize Michael and then other self entitled imbeciles saw that, and instead of looking for the interview to see what exactly was said, they simply proceeded to attack Michael’s character and say all sorts of things about the guy. I think social media outlets like Instagram and Twitter should police things like this and attempt to correct these situations because as we’ve seen, in this day and age, mere accusations, however unfounded they may be have and will continue to cost people their jobs and livelihoods. I agree with you, and have been thinking about this quite a bit. Andretti did not say anything out of line for a veteran racing man, every racing incident is quoted by a dozen or more pundits every time. I suppose he could have been more polite by not stating anything about who or what may have caused the crash but I agree the social media attacks are way over the top. It should go without saying that Michael has best intentions in mind for all of the drivers, Wickens included. Wickens is one that got a way for F1. I hope he makes a successful come back. I tape all of the races and the impact when his car first caught the fence was horrific, simply catastrophic. And then he and Hinch both were narrowly missed late in their slides after the main incidents - imagine if Hinch had another hard secondary hit! It's amazing that there aren't even more very serious secondary collisions as the pack goes by the wrecked vehicles. That catch fence, I don't have a solution but wow, it's sure a big risky place for a car to go. In that picture alone the fence looks terrible; I'm right with Bourdais that any running repairs to that must have been utterly inadequate. Was the repair truly inadequate, or merely, look that way to viewers? Well, Bourdais is certainly a lot more informed than a viewer. He was concerned about it, but when he spent a good long time talking to the race director he was apparently satisfied enough that he got back in the car. I think that indicates that the repairs were, in the end, adequate. IndyCar officials announced late Monday afternoon that Schmidt Peterson Motorsports driver Robert Wickens will undergo spinal surgery later this evening. Let us hope for the very best results. You do not know that... period. After his fourth-place finish, Bourdais explained to NBC Sports why he hesitated. “I’m old but I’m not wiser,” “Everybody’s in the seat and you gotta go. I wasn’t happy with it at all. The construction guys said thumbs-up; I’m glad nobody tried it because I’m not sure that would have been satisfactory. It’s just tough moments. He may have got back in the car (eventually) but it doesn't sound like he thought it was adequate at all. Did the device fail or did the seat belt come away from it? It looked like he was sitting pretty low in the cockpit when the car came to rest.
"" Tuesday, August 21: A post-surgery update has been provided by the Verizon IndyCar Series on Schmidt Peterson Motorsports driver Robert Wickens. Wickens’ spinal injury is of the greatest concern, and according to IndyCar, that portion of the operation was to “stabilize a thoracic spinal fracture.” ""
That ‘spinal cord’ instead of ‘spine’ is concerning. Schmidt Peterson Motorsports have announced that the Robert Wickens #6 entry will be withdrawn from the Bommarito Automotive Group 500 at Gateway, Illinois. Hardly a shock. Even in the best possible case of recovery he wouldn't be ready to race that soon. It said the problem was repairing both cars in time, I doubt we will see Wickens racing again this season. The withdrawal, aside from the repair aspect, is in part a matter of how long it can take to hash out a deal with a replacement driver. A similar thing happened in 1994 with Senna, with Williams only running one car in Monaco. Although I obviously lack the expertise of Bourdais, the replaced fence didn't look too sturdy to me. SDLRob has a point about how the repairs looked, though the outcome of a hypothetical second crash is impossible to predict. Run the same accident 100 times, 100 different things will happen. Lauda wouldn't be allowed back in the car so soon today, no chance. The rules were more lax back then, the choice was pretty much down to Niki and Ferrari. Now the F1 and IndyCar safety crews are far less cavalier. Schmidt and Peterson may have to call up Michael Shank and Jack Harvey to place their entry for the remaining 2 races. No point into placing the #6 car on the grid. Doctors have already performed surgery on his right arm and both legs, his spine was stabilized with titanium rods and screws. But nothing further. It is a slow recovery, but it is good news. 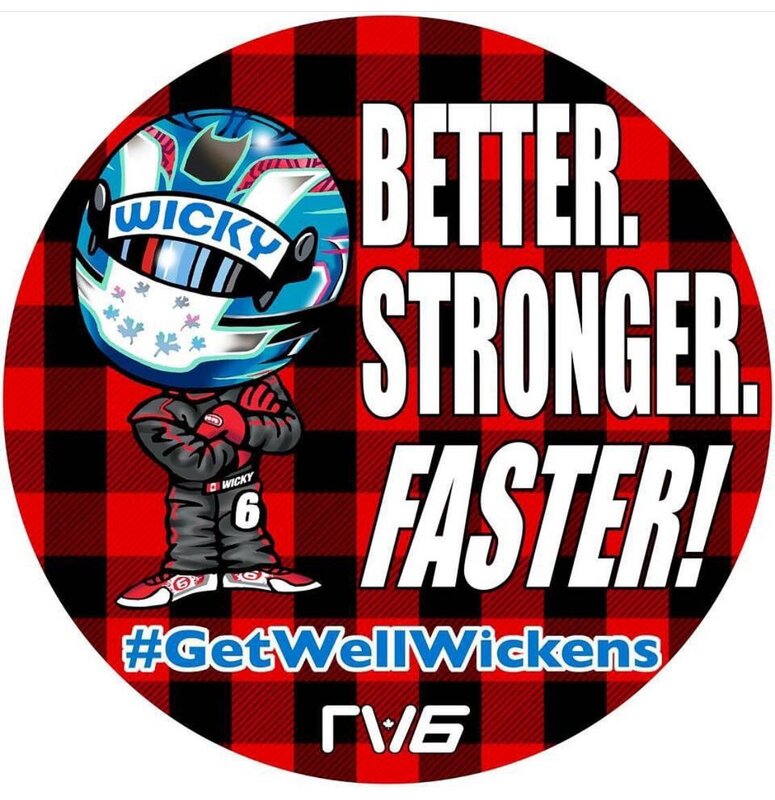 Wickens just got transferred to IU Health Methodist Hospital at Indianapolis and undergo more surgeries on his legs and other lower extremities. So happy he's improving. A friend of mine who is an Indy Car fanatic says he read somewhere that they expect him to make a full recovery. I can't find that anywhere but I sure hope so. Go Robbie! So it looks like early reports that he was doing well and heading for a full recovery were fabrications, much like reports that Schumacher was able to communicate. Barring a miracle, his chances of ever racing again seem slim to none. That's a catastrophic list of injuries. It depends on the severity of the injuries and how they heel up. None of those are necessarily career ending. A Thoracic spinal fracture for example has a huge range of severity. It will depend on the spinal cord injury really. Yep, my Father recently had an SCI, and spent several months in hospital - it will be a while until the full severity is known, and how much recovery will be needed or possible. Fingers crossed he gets through this.